The NHL trade deadline is about 3 weeks away, February 26th to be exact. These next 3 weeks will determine the near future of the franchise. Should the Bolts not make up any significant ground on the Southeast frontrunners, they will go into "sell" mode. 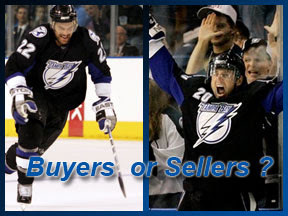 If last night's game was any sign, it appears the Bolts being sellers rather than buyers is the most likely scenario. "You have to be a realist," Feaster said. "I thought we were poised to do something after we got a win again against Edmonton last Tuesday, then we come out and the Ottawa game Thursday. ... I'm not going to beat a dead horse, but if this hockey team, and we were working hard again tonight, but we are not getting the saves, and if that's what we are going to be, we are not going to be able to stay in it. With Carolina winning tonight, these are desperate times, so we have to be planning on all contingencies right now." Sounds like a guy going in to sell mode to me. There have been many rumours floating around all season. Marty for Marty being the latest after Dallas GM Brett Hull was in the building for 2 consecutive games. But that one is very unlikely to happen. Marty has a NTC (no trade clause), as does Turco. For St. Louis to waive his to go to a contender is plausible, for Turco to waive his to come to a last place team, not so much. The most likely players to be dealt will be the teams top UFA's. Topping that list are Dan Bole and Vinny Prospal. It has been reported that Boyle is being actively shopped. Apparently Boyle's intention is to test free agency this offseason, so Feaster is looking to get something in return for the star defenseman. Vinny Prospal is also going to be a UFA this offseason. Many teams have been linked to him in the rumour mill. He is a top 6 forward that could solidify a playoff team. One rumour out there has Ottawa sending Joe Corvo and Ray Emery to the Tampa Bay Lightning for Dan Boyle and Vinny Prospal. The salary numbers are a wash, so it's good on that front. However, it's from the usual unreliable source, but it's out there. The one thing I will say is that I don't "expect" there to be any movement of the Big 3. Lecavalier IS the Lightning and moving him would destroy this team. Richards has a huge cap number and doesn't have the stats to justify it, plus he has a NTC. St. Louis has a NTC and at age 32, some teams may be weary of just what he has left in the tank. We all know the guy is far from done, but GM's see his size and age as a detriment. In the coming weeks, I will be posting all the rumours I come across whether I think they have legs or not. A little debate here and there does the soul good, eh! Culminating on February 26th when I will be monitoring every source available to bring you what actually happens! That's the fun thing about this time of year, you just never know. Well, the game started out well. Unfortunately, it didn't end so well. However, despite the 4-2 score, the Lightning are definitely moving in the right direction. The unfortunate part was the second period where no one was shooting. Shooting - that was the thing I left off of my laundry list. They need to do a lot more of it, and on a more consistent basis. It doesn't matter if it's a pretty shot, they just need to put pucks on net from anywhere and everywhere and as many as possible. The good: Holmqvist was, again, one of the best players on the ice tonight. The Lightning dominated in the faceoff circle. The team played far more consistently throughout the game than they have been I thought, other than the shots on goal, of course. And I felt that they had a lot of good energy and focus all gamea , too. The bad: Poor passing in the neutral zone - particularly in the first period. Short passes in the neutral zone is what they need to do, but they keep trying to make long passes thru there and those keep getting picked off. Offsides was also a problem in the first period. Tampa Bay seemed to be a more confident team, a better prepared team, and a more consistent team than before. It's too bad that they lost tonight, but as I said before, they're looking lot better than they have in a while. I will be attending the Vancouver at Tampa Bay game at the Forum on Thursday, so my post will probably be a bit later that night than they have been recently. Apparently, Luongo - who skipped the All-Star Game to be with his pregnant wife in South Florida - was allowed to skip tonight's Canuck game in Vancouver so he could avoid all of the traveling. So Vancouver will have a fresh goalie in net Thursday, however the rest of the team will have traveled after playing tonight at home. It'll be interesting to see how well Luongo plays. The NHL season's finally come down to this. We're starting in on the beginning of the end. The final stretch of the regular season. It's put up or shut up time in the NHL. The next two and a half months will separate the genuinely good teams from the pretenders. There's been quite a difference of opinion on which category the Lightning fall into by the so-called experts. I say "so-called" because I know hockey about as well as they do, and we're all biased in one way or another, but somehow my opinion seems to be more favorable. And it's not because they're more cynical than I am, since I can be pretty cynical. What it comes down to is this: the media, who are mostly Canadian I might add, are pretty down on the Lightning. However, I was looking at a mid-season poll done by ESPN last week, and at the time, 18% of the 17,000+ fans that had voted thought that Tampa Bay had a legitimate chance at winning the Stanley Cup. They were the third most voted for in the East after Ottawa and Philadelphia - and Tampa currently sits at the bottom of the Eastern Conference standings. So what does that tell me? The fans seem to know something that the media are deliberately overlooking. Fans are usually the hardest on their teams, but if 18% of 17,000 or so people think that the Lightning have a chance, then that's really saying something. The Lightning are 7 points out of first place in the Southeast Division (and out of third in the Eastern Conference), 9 points out of eighth place in the conference, with 32 games left to go in the season, and 2 games at hand over Carolina (the Southeast Division leader). So what do they need to do to make it to the second season of the NHL? Accurate passing, particularly thru the neutral zone, would be good, for one. Staying out of the penalty box, for another. The defense need to play defense, and the forwards need to produce offense. It's a simple concept, but one that tends to get lost in individual efforts. That goes along with keeping the game as simple as possible. They also need to start dictating the play on the ice, which is something they haven't really done all season. The need to play their game, their way, and force the other team to go along with it. Most importantly, the leaders in the locker room need to be the leaders on the ice. If the team isn't doing as well as they should, they need to do their best to carry them on their backs. Frankly, one guy needs to take charge and stay in charge, and I know that no one's really wanted to do that with Tim Taylor out. But it desperately needs to be done. You can't win by committee, no matter how hard you try. And when Taylor does come back, whoever's in charge needs to stay in charge and not just hand it off to Taylor at the first chance they get. A change like that is definitely not good for a team in the stretch run, and I don't think it'd be disrespectful to Taylor, either. It has to be one guy until the end of the season regardless of what happens, and I think Taylor would totally understand that. Out of the three guys who wear the "A" on the team, I think that the one who should take the team and bend it to his will ought to be Lecavalier. The entire team really looks to him to start things on the ice, anyway, so him taking total control would be the next logical step. And with him having been named captain of the East All-Star team, the idea's already been planted in their heads anyway. I think most of them would be relieved for it, to be honest. Now, you might think after reading this laundry list that this is an impossible task for the Lightning. I don't think so. The team has been doing most of this stuff off and on all season. They just need to put the pieces together, and I think having one clear-cut leader will really help with that. If they want it bad enough, then they'll do something about it. It's as simple as that. It just really just depends on how badly they want it. That's the bottom line. -The Bolts will open next season on the road in Prague. It will be a 2 game series against the Rangers on October 4th and 5th. -During the Board of Governors meeting this weekend, nothing new came forth with regard to the sale of the team. According to Bettman “there is nothing to report right now’’. -According to a report in Monday's Trib, Brad Richards has mononucelosis. Though Richards would not comment, the Tribune says multiple sources have confirmed the news. -In yesterday's All Star game, Marty St. Louis had 2 assists and finished +2, Vinny Lecavalier had 1 assist and finished -1. -The trade deadline is Feb. 26th. Pending UFA's Vinny Prospal, Dan Boyle, Johan Holqvist and Chris Gratton could be on the move in the next month. It's been driving me crazy to not be able to watch any of the NHL's All-Star Weekend - you just have no idea. But I've been finding things to occupy my time well enough, I guess. It's still making me a little batty, tho. Tonight was the Skills Competition/Young Stars game, and tomorrow night is the actual All-Star Game itself. I'm sure it probably went well. Those things usually do, and are pretty fun, too. Atlanta's actually not a bad place to watch hockey - I've been there a couple of times. The arena configuration's a little odd, but it works for them. It kind of reminds me of an opera house or something. But maybe that's just me. The concourse at the arena has a state fair kind of atmosphere, and the whole place is pretty colorful in general - but in a good way. I do have a suggestion for the Skills Competition, tho, one that I've thought about for a while now. Instead of showcasing just the talent at the All-Star Game, why not make it an actual league-wide competition? So here's my idea. I know that the Vancouver Canucks will put on their own skills competitions - or have in the past - for just the team. I'm sure other teams have done similar things. So why not standardize the competition? Have every team put on it's own skills competition, according to predetermined rules and standard equipment - supervised by the league, and have the teams send the results to the NHL. Then invite the top players in each event, regardless of team affiliation, to come to the All-Star Game Weekend and compete against each other. So it's an actual competition, instead of just a good time kind of show for the fans - really make it worth something. Whoever determines the location for these things can pick two locations, one in each conference, so that one can be announced at the end of the All-Star Game. I don't know that I'd let out what teams are up for it beforehand, tho. And I'm sure a year will give the host city plenty of time to set something up, too. Just some random thoughts for you this NHL All-Star break. Hope you're all enjoying the festivities, if you're able to. And good luck to all of the players tomorrow. Yes Bolts fans, it happened again. Riding high on a 3 game win streak, playing at home, the Lightning got trounced. As Cassie stated, this was a weird one. The Bolts were down 5-1 after two periods, were out shot 14-4 in the first, but never seemed to throw in the towel. The effort was there, but the play quality was not. That leads me to the title of the post, the good the bad and the ugly. Aside from the consistent effort, the return of Boyle was a great thing to see. With both wrists taped, he looked tentative early, for obvious reasons. But that soon changed. In his return after missing 36 games, he netted 2 goals, consistently got the puck in the zone on the power play, and finished the game with a +/- of 0. Craig MacDonald had a goal and finished the game +3. Nick Tarnasky had a goal and an assist and finished the game +2. The 2nd and 3rd lines, and defense. Chris Gratton was -5, Filip Kuba -4, Jason Ward -4, Jan Hlavac -3, Lukowich -2, Ranger -2. Daniel Alfredsson had 7 points, a hat trick and 4 assists. Johan Holmqvist surrendered 3 goals on 14 shots in the first and was pulled to start the second. Kari Ramo gave up 5 goals on 22 shots in relief. So what does it all mean? Most likely the beginning of another Lightning winning streak to come after the All Star break! But who knows really. This team has been so Jekyll and Hyde this year, there is no telling what the second half of the season will bring. Also of note, Brett Hull and Dave Taylor of the Dallas Stars were at their second consecutive game last night. With all the rumours about a St. Louis for Turco trade that were bouncing around earlier this season, this should raise some eyebrows. When asked, Brett Hull said "We're not looking at anybody in particular, just a stop along the way, it's that time of the year, you know?" Yeah right. He may not be eyeing Marty, but UFA's-to-be Prospal and Holmqvist could be on their radar. 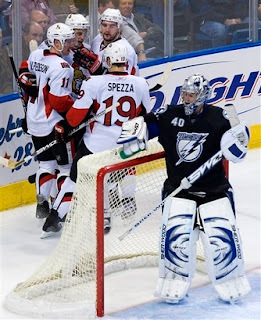 The Lightning lost to the Ottawa Senators 8-4. I'm still trying to wrap my mind around this one. While people are going to be upset about the score, and obviously with good reason, I'm still trying to figure out why it happened. This was a very weird game to me. Dan Boyle came back to finally play again - and had a good game, I should add, Tampa Bay was on a mini-winning streak, they were at home, they were playing against a team they've played well against this season, and they had a hot goaltender - all of the ingredients to have a fantastic game they should've had a great chance of winning. But they didn't. In fact, they played horribly but showed a good effort, and that's really strange. The worst part was their problems in the neutral zone - their serious trouble spot all season long. Their passes were getting picked off - and worse than that, they were passing directly to the other team (I know, not intentionally). That's where the major problems were coming from, right there. But I don't think it was a case of the team mentally going on their All-Star break vacations early. They did absolutely nothing that they'd been doing for the past few games which gave them their recent success. It was as if they decided to try something entirely different, just for kicks and giggles. I realize that that was probably not the game plan originally, but that's what happened, for whatever reason. Give it to Ottawa, tho. They certainly showed why they're the best team in the Eastern Conference. Alfredsson was a one-man wrecking crew with 6 points on the night - a hattrick and three assists. He's now tied for the league scoring lead with Vinny Lecavalier. What it looked like to me was a lack of leadership on the team - and I'm not talking about coaching. Again, I'm not sure what the story was with that since usually that's not a problem with this team, but I could probably hazard a guess or two. However, that's just pure speculation on my part, so I won't get into that here. Well, the team has the weekend to take a much needed mental break and hopefully have their heads cleared for the game on Tuesday against Buffalo. Let's hope that one turns out better, shall we? The Tampa Bay Lightning are now the proud owners of a 3-game winning streak. (Congratulations - I hope they'll be very happy together.) They beat the Edmonton Oilers in a 4-3 game that came right down to the end. Of course, it didn't have to come right down to the end, since the Lightning were up 4-1 at one point, but that's the way it goes when you're turning things around sometimes. The first period was something of a yawner. Both teams were playing cautiously and trying to feel the other team out. It was well played defensively, tho, by both teams. And it was much the same for the second period, although things started picking up towards the end. The Lightning seemed to have figured out their passing problem, for this game at least. That seems to come and go, tho. It got interesting in the third, tho. I felt that the Lightning had control of the game, for the most part. There was a bit of a collapse at the end, but nothing nearly as bad as has been happening in recent games. It's as if they're slowly purging themselves of the poor play they've been having. They still do the occasional unfortunate thing, but they're becoming less and less as we go on. I find that to be very encouraging. Frankly, after Holmqvist's shutout streak came to an end, I didn't really care what the score ended up being - so long as the Lightning won. Ultimately, it's that bottom line that matters most. The manner in which it happens is very helpful, but it's the results that count. And that's fairly true for most things in life, really, if you think about it. But they did win tonight, while Carolina & Atlanta lost. So they're again only 7 points out of first in the Southeast Division standings, and out of playoffs, with 33 games left in the season. Unfortunately, Florida won, but you can't have everything - at least not in one night. I would just like to remind everyone who either got down on Tampa Bay, or started panicking, that this is the exact same team that lost all of those games in the past few weeks. There have been no firings, no trades - as well as no real serious threat of trades, and yet they've managed to turn things around all on their own. Sure, it's still early in the turnaround, but you've got to have a little bit more faith and trust in people, you know? GM Jay Feaster had another press conference at which he reiterated the unlikelihood of getting us any missing pieces before the February trade deadline. Sale of the team still pending, current ownership not willing to increase payroll before the sale goes through, prospective owner unable to act because he doesn't yet own the team, GM hamstrung, yada yada yada. So if the Bolts are to make another Cup run, they'd best turn to their secret weapons. As we see in this stolen photograph from a Prospects camp unknown to the usual media outlets, help is on the way! This future player's role remains a mystery. Will he be: (1) a top-6 forward to jump start the second line? (2) a consistent 3rd line center? (3) a consistent 4th line checker? (4) that elusive All-Star goalie who carries the team on his back? Stay tuned to Bolts Blog and SeSo to find out! I wandered over to Lightning practice again today. It wasn't a long practice, but it was a good one, I think. Other than the poor passing, that is. In a way, I guess it's good to see that it's not just a game thing, but simply a team thing. Passes were too far ahead of guys, or in their skates, or bouncing off of their sticks. They were working on breakout passes, too, so this was all either in the neutral zone or just at the blue line of the offensive zone. Either place, and you're looking at getting picked off or an offsides penalty. They've been doing that all season long, too - that's the sad part. I think it's a combination of things, but mostly I think that a lot of the team just aren't that aware of where they are on the ice in regards to everything else. They get a lot of icing calls when they shouldn't, some offsides calls, but not a lot of too many men on the ice calls - so they are pretty aware of the bench area, I guess. In my mind, I think you need to be aware of the blue lines and your teammates, at the very least, followed by the center line, the other team, and the bench - in no particular order. They seem to be focusing almost exclusively on what they need to do as opposed to where they are and what they need to do. That's fairly clear since they set up on the same side every single time on the powerplay and rarely leave that side at all during the powerplay - or any offensive play, for that matter. I was standing at center ice, next to a door in the rink, and part of the practice Coach Tortorella was right in front of me. I really wanted to crack open the door and let him know what I was seeing, but I didn't think he'd really appreciate that much. It's hard to tell whether a coach has a sense of humor about that kind of thing sometimes, so I decided not to take the chance. Frankly, I would've enjoyed sitting there talking about hockey with the man, but that's the way it goes. I was also thinking, as I was watching hockey practice, that there aren't many places to watch practice where you can really enjoy it. You can't see the corners standing on the glass at center ice, you can't see past the players if you stand in a corner, and you have to deal with flying pucks and the noise of pucks hitting the glass when behind the goalie. Personally, I think the best place to be would be sitting on the bench, so I can also hear what's going on. But somehow, I don't think that would go over very well, either. Edmonton had an optional practice, so there weren't many guys there. I watched it for about 10 minutes before heading out. It wasn't that exciting since they were just doing shooting drills. Speaking of hockey, I realized today that the All-Star game is on Versus - a channel I don't get. I'm not very happy about that, but what can you do? I'll look into heading to a sports bar maybe. We'll see how that goes, I suppose. You'd think I'd be used to that since I get probably only half of the regular season Tampa Bay games televised, but even that still makes me cranky. You know, I think Johan Holmqvist probably just won back the starting goaltender position. But, back to back shutouts on the road will probably do that for a guy, huh? It's just a crazy I thought I had. It's good to see the Lightning really starting to pull things back together again. It's still going to be a hard climb back into playoff standings, but you've got to start somewhere, right? Same goes for Lecavalier's empty net goal - you've got to start back somewhere. Frankly, I was happy to see that. I'd like for him to win the Art Ross Trophy (for the NHL's leading scorer) at the end of the season, if he can. This sort of reminds me of an old mountain climbing thought. Reaching the top of the peak is only halfway thru the journey; it's not the destination. You've still got to make it back to your car at the foot of the mountain - back to where you started - so you finally can go home. Well, you could probably look at this season for Tampa Bay in the reverse of that; as more of a trip down from a ridge, where you parked the car, down to the river valley a 1,000 feet below and back up again. I think the Lightning have finally started back up from the river. Of course, there's no way of knowing what will happen between the river and the ridgetop, but going back up towards the car on your own power is probably better than having to be airlifted out. The Tampa Bay Lightning are an interesting team. A month ago, they couldn't buy a win on the road, and now they've got three road wins in a row. For most of this season, they've played strong second periods. But the last couple of games the second periods have been their weakest period of the game. It's either one way or another with these guys, it seems. Good for André Roy, by the way. He had his first 3-point NHL game against his former team. It's kind of nice to see a guy who's known as an enforcer/third or fourth line guy have a really good skilled (for lack of a better word) kind of game. I think he could be a solid 10-15 goal guy, if given the right encouragement and the opportunity. But then, I tend to think that most enforcer-types are more offensively skilled than they're given credit for. Holmqvist, again, saved the Lightning - particularly in the second period. It helps that the defense is starting to really come together, too, but Holmqvist should be given a little more credit than what he gets. He's not a star goaltender, but he's far better than most people think. The Lightning really lucked out that Crosby was injured. Luckily for Crosby - and for Pittsburgh - it wasn't anything severe. But I think that him having to leave the game really left the door open for Tampa Bay to win it. Although, to be honest, I don't think that Pittsburgh missed him all that much. From what I could tell, they were doing alright without him. Hopefully, Lecavalier can break out of this scoring slump sooner rather than later. He's up to 4 games now without a point, and 5 games without a goal, I think. But, if someone's got to be in a slump, it's better to be slumping now instead of later. I don't know about you, but I'd rather see it happen now instead at the end of the season when it's going to be very important for him to be contributing on the scoresheet. And at least the rest of the team is starting to heat up while he's cooled down, too. Congratulations to Vinny Lecavalier for being named captain of the Eastern Conference squad at the All-Star Game, by the way. It's a well-deserved honor for him, I think. Jerome Iginla of the Calgary Flames and Vincent Lecavalier of the Tampa Bay Lightning have been named captains for the Jan. 27 NHL all-star game in Atlanta. Iginla, making his fourth career all-star game appearance, will wear the 'C' for the Western Conference while Lecavalier, skating in his third all-star game, will lead the East. Both players were voted in as starters in fan balloting. Also, check out this goal from Rick Nash of Columbus. INSANE!!!!! I've been reading all morning about the Lightning's 8 am practice, and how most of the local media is ready to scrap the season - all after last night's game. Personally, I don't get it. Maybe I'm missing something, but I don't think it's all that bad right now. It's not great, but it's certainly not rock bottom, either. Let me try to put it all in perspective. Right now, the Lightning are 9 points out of playoffs in the standings. Not just 9 points out of 8th, but 9 points out of 3rd - that's right, they can still win the Southeast Division. Besides that, they still have 36 games left in the season - and 12 of those against Southeast Division teams. Sure, if they keep on playing inconsistently, they're not going to make it. But, really - 9 points out and 36 games left to go? With Dan Boyle coming back in the next week or so? I think it's still a little early to be pulling the plug on these guys. As for last night's game, I honestly think they played alright. Really, the only thing they didn't do was shoot the puck. They were skating, hitting, winning faceoffs - the whole bit. Yeah, they were shut out, but they did have 22 shots in the third. Let's give Theodore a little credit here - he played an outstanding third period. The way Theodore played the third, who's to say that the Lightning would've gotten anything the rest of the game anyway? My only problem with the game last night was the lack of shooting. That's it. And the score, of course - but that goes without saying. It's my personal belief that at least the forwards ought to be getting 3 shots on goal every game - legitimate shots on goal, too, not just attempts. But I'm not the coach, so it's not for me to be making that call. So, seriously, let's all take a step back, take a deep breath, and support these guys. There's still time to turn things around. Trust me. A couple of games ago, I noticed something about this team. It was against Pittsburgh, they were struggling on the power play once again, and seemed overly predictable. They kept cycling the puck around with the ultimate goal of getting Lecavalier an open shot from the right circle. Apparently the Penguins had done their homework and loaded up the right side of the ice and blocked most of his shots, or took away any shooting lanes. Looking to the left circle, I noticed there was no one there. Marty was somewhere in between the circles, Brad at the point, and the defensemen at the corners. When Marty was fed, he never seemed to be in position to shoot. That's when it hit me. I started looking for a right handed shot. Surely there was someone on the ice who could take a shot from the left circle? Someone who could pull defensemen away from Vinny and open up some shooting lanes. Let's see...Marty-Lefty, Brad-Lefty, Vinny4, Vinny20-Lefties. Not a soul on the ice with a right handed shot. So I did some crack research, in fact, all but 2 lightning players, Ward and Wanvig, are lefties. It may not seem like much, but not having a guy in position on the left side of the ice who can snap off a shot is a big deal. As we have seen, without it a team is predictable, specifically on the power play. It pushes the balance of action to the right, allowing the defense to "cheat" to that side, close off shooting lanes, block passes, and shut down key shooters. I'm not saying that this is the answer to all the Lightning's problems. It was merely an observation by a fan. And if I see it, I'm sure the Bolts opposition sees it. Just about the same time as I came up with this "brilliant" observation, the Bolts traded for right-handed winger Junior Lessard. Power play sniper and Hobey Baker winner. Coincidence? Maybe...maybe not! The Bolts seem to be starting a new trend. After having loads of trouble winning on the road, and finding success at home, things have gone screwy. Now the Bolts are winners of two in a row on the road and losers of two in a row at home. It's like the Lightning are living in a bizarro world this season. The Lightning came out physical in the first, both Wanvig and OB got 5 for fightnig. They seemed to be "beating" the Lanche at their own game. (bad pun intended) No points were registered in the period. The second period belonged to Colorado. The Lightning only got 3 shots on Theodore, none got past him. Colorado got 2 second period power play goals (Finger & Stastny), and that was enough to do in the Bolts. In the third, the Bolts put up 22 of their 32 shots on goal. Unfortunately Theodore stood on his head, and that was that. Ramo got the start in net for the Lightning and stopped 22 of 24. The last Colorado goal was an empty netter and didn't count against him. Fortunately the Lightning now hit the road ;) to take on Pittsburgh once again, and then head on to Ottawa. 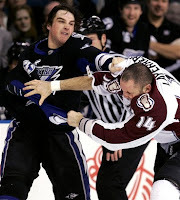 The Tampa Bay Lightning versus the Colorado Avalanche...this was an interesting game. Well, I thought it was, anyway. Unfortunately, the Lightning lost. There were three things that buried them in this game. They didn't take advantage of Colorado's slow start in the first period, they only had a total of three second period shots, and that Theodore managed to stop everything they had in the third period. The Lightning came out hitting from the start, and I think that really threw the Avalanche off of their game for the first 10 minutes or so. To me, Colorado looked a little stunned and unsure of themselves at the beginning. Tampa isn't usually a physical team, and Colorado wasn't expecting them to be. It was a brilliant move by the Lightning, to say the least. However, they didn't following it up with scoring and the Avalanche were able to adjust. The second period, which is typically the Lightning's best period this season, was flat. I think Tampa got caught up in hitting and playing physical, and they forgot to be offensive. I've noticed that about this team - they're very single minded in terms of their play. Either they're physical, or they're offensive, or they're defensive - it's rarely everything at once. There seems to be a little problem with multitasking. I haven't decided if it's just the stereotypical guy problem of multitasking, or if it's a coaching thing. I'm sort of leaning towards the coaching side myself. I actually think that Tortorella's a pretty good coach, but focusing on one thing at a time instead of a more unified style may not be a solution. Not saying that he does that, but sometimes it appears to be that way. And the third period, well, that was all about Jose Theodore. The guy stopped all 20+ shots the Lightning had that period. Can't fault Tampa Bay for their work ethic with that. Not that Ramo did all that poorly - because he didn't - but he also didn't have 20+ shots to face in a single period this game, either. Despite the score, and the lack of shots during the second period, it was a good game. It was very much like a Western Conference game to me - particularly at the beginning. The Lightning didn't play their regular game, but came out with a different look. It was a very entertaining style of hockey, but also a difficult style to maintain for very long. Playing physical and hitting as much as they did would definitely wear down players and make them more susceptible to injury. Particularly when many of these guys log over 20 minutes a game on a regular basis. But still, it was as if they were an entirely different Lightning team that took to the ice tonight. There was absolutely no indication of that yesterday when I saw them at practice, so it was something of a surprise for me. Makes me wonder what happened between yesterday and today to make them change like that. I know I am miserably late with this, but as most of you know Marty St. Louis was named to the Eastern Conference All Star roster. The Bolts winger has put up 17 goals and 36 assists this season. He is also +1. Also just announced, Mike Lundin has been named to the Young Stars team. The rookie defenseman has been a gem in what has been a struggling lightning D. The former Maine Black Bear is one of the few Lightning defensemen on the plus side of things at +1. TRADE ALERT: The Bolts have traded Dan Jancevski to Dallas for winger Junior Lessard. Lessard, 6-feet and 200 pounds, has played in 36 games with the AHL’s Iowa Stars this season. He ranks fourth on the Stars in goals with 10 and points with 21 with six of his goals coming on the power play to lead the team. I wandered across the Bay today to get my hockey fix. I enjoy watching hockey practice - almost better than games, actually. Seeing the drills and the guys having a good time takes me back, you know? And the players seem like they have so much more fun at practice. I realize that games are a more serious thing, but unless it's a blowout, and the team you follow is winning, they don't look like they're having a lot of fun. I know they enjoy the competition, but that's not quite the same thing. As I was leaving Lightning practice, I caught some movement out of the corner of my eye. I glanced over to the other sheet of ice and noticed that the Colorado Avalanche was just starting their practice, so I caught about half an hour of that - which was about the length of their organized practice, anyways. I had no idea that Colorado was even in town, let alone that they were practicing there, so that was a pleasant surprise. I know that they played the Florida Panthers last night, but I sort of thought that's where they'd practice before coming over this way. They play Tampa Bay tomorrow night. I haven't seen Colorado play since the season before the lockout, but I used to watch them regularly, and there were only about five or six guys that I recognized. For some weird reason, I kept looking for Chris Drury - isn't that strange? He hasn't played there in forever, and I didn't pay all that much attention to him when he was there. I wasn't looking for Joe Sakic, who I knew didn't make the trip since he just had surgery - hernia, I think. My mind works weirdly sometimes. You want to hear weird? The very first thing that I noticed about the Avs was that nobody takes full strides when they skate. Everyone takes short strides for some strange reason. I wonder if they draft and trade for that - because they all do it. They're quick, but I think the Lightning are probably faster. I also noticed that they're a short team, too. I was standing at the corner of the rink for a little bit, and they were doing a drill so they were lined up in my corner, so the entire team went thru the line a couple of times before I went to sit down. I was wearing athletic shoes, and I was almost as tall as some of them in their skates - and I'm 5'8½" with bare feet. Most of Tampa's pretty tall, and I'd just watched them skate, so maybe that's why I noticed it. It wasn't until I saw Colorado practice today that I realized how much of a finesse team the Lightning really are. Colorado is a physical team that likes to play the body first, instead of the puck. They'll grind a team into the corners until they tire them out. They're very aggressive and they can score, too. After watching them for a few minutes, it was obvious to me how much of a mark Forsberg left on this team. Even after being gone for 3½ seasons, that's the style of play they favor - the bone-crunching, injury inducing hockey style of Forsberg in his prime. Tampa Bay doesn't play all that physical. They can, but that's not their style. Actually, it's not really much of an Eastern Conference style - except for Philadelphia, of course. The Western Conference is far more physical than the Eastern Conference. I don't know whether that's a good thing or a bad thing, but that's how it is. It's something to keep in mind when watching this game tomorrow night, anyway. The Lightning now have won two games straight on the road. That's the first time this season they've managed to do that. And I think tonight's game was only their 5th or 6th road win this season as well. They've not had a good time on the road, but I think they might've just turned the corner on that. I saw some really good things that went on in this game. Holmqvist was aggressive in net, which I thought was great. He hasn't come out of the net to challenge many shooters much so far this season, and he was doing that tonight. That's a sign of confidence, and considering how he hasn't been playing a lot lately, good for him. Kuba was having a very good game. I thought that those two blocked shots were very nicely done. There were a lot of blocked shots in this game, but his were the more obvious. But I guess sliding across the ice after letting a guy get past you would be more noticeable. And I think that getting scoring from the 3rd and 4th lines tonight was exactly what they needed. It's unfortunate that they had a mini-collapse at the end of the third, but they did hold on to win. When you've gotten out of the practice of holding on to leads, sometimes it takes a while for that to come back to you. So, Tampa Bay is definitely doing good things - winning being the best of them all. Apparently, the Lightning are only 10 points out of a playoff spot in the Eastern Conference. Sad thing for the Conference, but good thing for the Lightning. So it is still possible for this team to make it to playoffs. And if they manage to stick to their winning ways, they should make it there. The Tampa lost tonight to the Pittsburgh Penguins by 4-1 - although, empty net goals always make games look worse than they are. In this case, there was only one, but even still. Honestly, other than the score, I don't have much to complain about. The one thing that I've appreciated about the Lightning is that they never quit at the end of the game, no matter how badly they're losing. And they don't do stupid things at the end of games during blowouts, either. That kind of drive and discipline is pretty admirable, frankly. Most teams just let the game go and start settling up scores instead. That might be emotionally satisfying, but it doesn't really get you very far when it's all said and done. From what I could tell, the Lightning outshot the Penguins, won the majority of faceoffs, and took fewer penalties. There wasn't much lag in this game, despite having come back after being on the road for a week. The energy was up, the tempo was up - it was a pretty well-played game as a whole. It's just that Pittsburgh was luckier around the net is all. And, as in most situations, it's almost always better to be lucky than good. It's best to be both, really, but you can't have everything. As for the highly touted Lecavalier-Crosby matchup, I'd have to say that I think Lecavalier totally won that. Crosby didn't really stand out in this game. To me, it was obviously man versus boy - with Crosby being the boy, of course. I have to admit, tho, that Crosby doesn't impress me much. I think he's a very good hockey player, and will probably only get better as he goes along, but I just can't stand his cocky attitude - even tho I know he's earned it. He's also sort of a one-dimensional player at this point, anyway. That'll probably change as he matures, tho. And, I don't think anyone under the age of 25 should be named captain of an NHL team. I think it's just wrong in so many ways. Yes, I realize that Lecavalier was captain of the Lightning at 20 years old. I was saying the exact same thing about him then as I am now about Crosby in regards to the captaincy. And I think Lecavalier would make an excellent captain now - no question about that. It's both an age and maturity thing for me, and I don't think it's fair to either the younger guy or to the rest of the team to put someone in the position. A lot of people get short-changed with that. To be fair, I should probably mention - for all of you Crosby fans - that I've never like Gretzky much as a player, either. He was, no doubt, the greatest offensive player to have ever played the game of hockey (even tho he was pretty much just a sniper hanging out around the net for half the time). I won't argue with anyone about that. However, Gretzky couldn't play defensively to save his life. I think that in order to be considered the "greatest hockey player of all time," they should probably be a well-rounded player. But, I know that I'm so in the minority with that kind of thinking. As for the Lightning's loss, well, even very good teams have to lose sometimes. The point is that they're definitely getting back on track, and it shows. The wins will come again, and probably fairly soon, too. The Lightning finally won another game on the road last night - their 4th road win, I believe - and ended a 7-game losing streak against the NY Rangers. Good for them. It was about time. After a shaky goal scored against them in the first, they roared back to life. It was great to see other lines and the defensemen getting into the scoring. If they can keep it up, this team can go anywhere they want to. Sure, the Rangers are in a bit of a slump themselves, but they weren't playing so bad last night. Now, about those penalties.... Officiating hasn't been at its best this season. Calls have been very inconsistent, even for the same team during the same game. For the last couple of years, the officials have been pretty good, but this season has just been bad. I thought that the reason for putting 2 referees on the ice was for more consistency. At this point, they just seem to be an extra body. I wonder what the story behind that is. 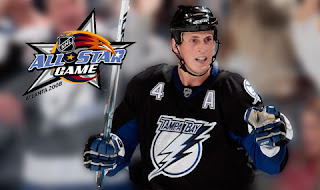 Oh, and, congratulations to Vincent Lecavalier for being a starter at the All-Star Game. His team may not be doing that well, but since he's the leading scorer in the NHL currently, it only seems right that he gets to be a starter. Thank you all you hockey fans who voted with me for him. Craig MacDonald es muy macho. The gritty fourth-line grinder’s horrifying mouth injury & ensuing adventures in dentistry made some headlines in the hockey world. 50 stitches. 9 broken teeth. 3 root canals. Sounds like a nightmarish version of the 12 days of Christmas. Equally staggering to me is the fact that MacDonald played against the Capitals 6 days later. MacDonald’s mouthful of pain was the most ghoulish thing to happen to the Lightning since Boyle’s severed wrist tendons. MacDonald’s got the kind of grit the Bolts need to muster if they have any hope of making this year’s playoffs. “The drill is turned on. I sit and I wait. The drill comes and the drill hits and I squeeze the [tennis] balls so hard that I think my fingers are f*king breaking and I moan. I moan in a steady tone that fills my ears so that I don’t have to hear the drill but I still hear it and I concentrate on the sound of the moan so that it will distract me from the pain but it doesn’t. Bayonet bayonet bayonet bayonet bayonet. The drill makes a hole and moves around the circumference of the hole and makes it wider and the grit mixes with the spray and moves down my throat and collects beneath my tongue. Bayonet, bayonet, bayonet. The hole gets larger and larger. Bayonet bayonet bayonet. There’s a f*king drill in my mouth. Bayonet.” (from A Million Little Pieces, Mom edits added). While Frey goes for a hyped-up Hemingway style, the muy macho MacDonald has been understated in describing the effects of taking a puck in the mouth. "I've never had anything like that feeling in my life," MacDonald told the Tampa Tribune. "You go to stick your tongue out and there's nothing in your mouth. It wasn't fun for a couple of minutes until I figured out exactly what was going on." Now that’s grit. That’s the old-time hockey of all guts and no glory. In case you’re wondering how a soccer mom can handle such gory details, have I got some birth stories for you . . .
Yep, you read it right. The Bolts finally got a win, and even more amazing, they did it on the road. The Lightning got goals from some unexpected places. Chris Gratton had a huge night registering two goals and an assist. Doug Janik netted his 1st of the season, and the final 2 Lightning goals came from Prospal and an empty netter from St. Louis. The goal by Marty was his 200th career goal. The Lightning played probably the best 1st period of the season. After going down 1-0 on a mishandled puck by Ramo, the Bolts fired right back. Janik launched a shot from the point that redirected off a Ranger stick to beat Lundqvist, and tie the game at one. The Bolts next goal was a thing of beauty eh. Hlavac forchecked hard and won the puck in the left corner, skated out and sent a perfect no look backhand pass to Jason Ward. Ward then touched it to Gratton who buried it for the Bolts second goal of the game. In the Second, Gratton put the Lightning up by 3 when he redirected a Shane O'Brien shot past Lundqvist. Midway through the period, Vinny Prospal beat Lundqvist high glove off a great feed from St. Louis. The third period was not what the Bolts wanted. Up 4-2 heading into the final period, the Lightning were seemingly in control. But as has been the case, holding onto a lead in the third has not been the Lightning's forte'. This game was no different. 6 consecutive Ranger power plays didn't help matters. The largest being a 4 minute double minor to MacDonald for high sticking. (The call should have gone to Tyutin for tripping MacDonald, who clipped Tyutin with the stick as he was falling on his behind, IMO) The Rangers promptly scored on the first half of the double to pull within 1. Here we go again, right? The Bolts then took a bad too many men on the ice penalty do be shorthanded 5 on 3. But low and behold, things actually went the Bolts way. A great penalty kill effort by Ranger, Kuba and Richards kept the Rangers off the board. The game ended with Lundqvist pulled, and Vinny feeding Marty for the Empty netter and his 200th career goal. The Bolts now head home to face Sid the Kid Thursday night. Reigning NHL MVP and scoring champion Sidney Crosby of the Pittsburgh Penguins, who led all vote-getters for the second consecutive season with 507,274 votes, heads the list of six Eastern Conference starters. Crosby's linemates will be current NHL scoring leader Vincent Lecavalier of the Tampa Bay Lightning (224,661) and Ottawa Senators right wing Daniel Alfredsson (224,483), each of whom will make his first career start. Voted to the Eastern Conference blueline are Andrei Markov of the Montreal Canadiens (316,136) and Zdeno Chara of the Boston Bruins (271,272), also first-time starters. The goaltender will be Martin Brodeur of the New Jersey Devils (220,392), who captured his fourth career All-Star starting berth and will be making his 10th appearance overall, tied with the Red Wings' Lidstrom for the most among the players announced today. Having reached the midway point in the season, and with the Bolts sitting in last place in the East, talk is heating up. One HUGE stumbling block to any deal with regard to the Lightning is the current ownership situation. Until that is resolved one way or the other, nothing will happen. That being said, if it is resolved before the trade deadline, here are some things to watch for. First off, the most chatter seems to be surrounding the future of Dan Boyle. If he is able to come back healthy prior to the trade deadline, he could be a rental player at the top of many playoff bound team's wish lists. He is a pending UFA, and could be shopped for picks or prospects. However, with the Bolts defense being so bad this season, it would have to be a great deal for Feaster to move him and his rights out of Tampa. Another UFA to be is Vinny Prospal. Vinny20 had a great start to this "contract year", but had a subsequent lull. He has seen a bit of a resurgence on this latest road trip , and he could end up on the trading block. Look for Detroit and Anaheim (if Teemu doesn't come back) to show interest in his services. Other UFA's and RFA's this coming off season include Gratton, Karlsson, Craig, Hlavac, Roy and Darche. Also, keep in mind Holmer is slated to be a UFA at season;s end as well. If management truly believes Ramo is the future, Holmer could be moved. He was said to be one of last season's hottest goalie UFA's, so there most likely will be serious interest in his services. If he is dealt, the Bolts could turn to a veteran like Cujo of Belfore to fill in for the remainder of the season. Don't expect any movement of the BIG 3. Marty and Brad have NTC's, and moving Vinny would turn the city against management, spell disaster for season ticket renewals, and spell certain death for the franchise. If anything, should the ownership transfer go through, look for Vinny to re-upped long term at or very near the maximum allowed by the CBA which is no more than 20% of the current salary cap number. Currently that would be $10 mil/season. Want to chime in on how you think the Bolts players rank? Head over to the Boltsmag.com poll. Let your voice be heard! The Bolts dropped their 7th straight tonight in Ottawa. They had a 2 goal lead at two points in this game, but it was not enough. The Sens forced overtime, and snuck one by Holmer to get the 2 points. Lightning goals came from Vinny, Marty and Hlavac. It's hard to take away positives from a 7th consecutive loss, but at this point I feel that's what we need to do. Sometimes it's just not your day, in terms of this team, it just hasn't been their season. Not that the Bay area hasn't been through this before. How many seasons have the Bucs missed the playoffs after winning the division the year before? It happens. I've seen people on boards refer to the Lightning as "The Dolts", calling for Torts and Feaster's head, etc, etc, etc. What's the point of that? We as Lightning fans are all frustrated, but come on. You have the best player in the league in Lecavalier working his tail off every night, and putting up league leading points. Dolts? Vinny 4 deserves a bit better, don't ya think? Who's at fault for this season will be a decision left up to possibly the new ownership when it takes over, and the upper management. Until then, support your Bolts, look at what they are doing right, analyze what they could be doing better, and enjoy NHL hockey in your sunny back yard. 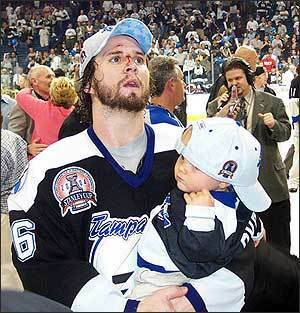 Tampa lost a heartbreaker tonight. They were having one of their best games in the last month or so, and lost in overtime to Ottawa - which is one of the best teams in the league. If the puck had bounced another way, then they might've been able to pull it out and win it. There are a lot of positives to get out of this game for the Lightning, tho. One is that they get a point in the standings for just getting to overtime. Personally, I think that rule ought to be changed to 2 points for a win and 1 point for a loss - period. But it is helpful to a team like Tampa to at least get a point out of it for all of their effort. Anything to break a losing streak, you know. Another positive was their great start at the beginning of the game. The stats have been floating around about how the second is their best period and all of that, but the slow starts haven't been helping them much, either. I liked the consistency of effort the Lightning had for both the first and second periods, as well as the end of the third and for overtime. It was one of the most consistent games that I've seen from them in a long time, even with that lapse in the third. In the third period , they regressed back to how they've been playing: tentative and afraid to lose. The Lightning weren't shooting the puck, either, which is one of my biggest pet peeves. It wasn't until around 8 minutes left or so in the game that they finally pulled themselves back together to try to win things. Frankly, they were very lucky that Holmqvist was one of their best players tonight, even taking into consideration the overtime goal that he should've had. They were really lucky that Ottawa only scored one goal in the third period, they way things had been going. While all of the goals were fairly pretty in this game, Lecavalier's goal was spectacular. He's such a dog that he can take a pass that's behind him, push it thru his own legs, onto his backhand, and still score. He is a very talented hockey player, but also a guy who has far too much time on his hands to be able to practice something like that enough to make it work and seem so effortless in a game situation. The bottom line for this game is that they were really close to beating the second best team in the NHL. That's not too shabby for a teams that's currently sitting at 29th out of 30 NHL teams. Frankly, I think that's something to feel pretty good about and to draw some motivation from. Sure, it hurt to lose like that in overtime, but I think that with more consistency to their play, they'll be able to the next time around. Personally, my philosophy with a losing streak is that, if it's not going well for you anyway, you've really got nothing else to lose so you can try just about anything. After all, the worst you can do is lose, and if you're already doing that then why not? You're more apt to make a mistake if you're trying not to. At least, that's been my experience. I think that they'll break out of this funk of theirs and be back to their winning ways in the next week or two. Hopefully the All-Star break won't interfere with that. Thanks for having me along for the second half of the season - and hopefully playoffs, as well. I know it looks bad right now for the Lightning, however, I think there's potential for a serious turn around. But we'll get into all that later. Think of me as your blog color commentator. I probably won't be getting into many of the details of the game since that's what the box scores, game recaps, and newspaper articles are for. Why repeat the obvious, you know? Instead, I'll be serving up my impressions of games, what they can possibly do better, what they've done well - that sort of thing. It may be halfway thru the season, but I'm still getting to know this team, so please bear with me if my assessments aren't right on. I don't get to go to many games, at least not this season, but I watch what I can or listen to it over the radio. Yep, I am a die hard hockey fan. Only we die hards listen to hockey on the radio, I think. So I should have something for you if not right after the game, then it'll certainly be the following day. Work often gets in the way of that, so it might not be until the following evening. But I'll try my best. I look forward to hanging out with you all for the next few months. Please feel free to comment or ask me questions. Here's to having a great second half! A well rounded sports background, and a love for hockey! What more could you ask for. Welcome aboard Cassie! Torts called out his "core" players after the loss in Toronto, and they responded. Vinny Prospal had a goal and two assists. Vinny Lecavalier and Marty St. Louis both has a goal and an assist. "I think our top players threw it right in my face after we challenged them the other day because they were the best players on the ice." Tortorella said, "I think we battled hard to come back. So we have to just keep on finding the positives and just keep on getting better." The team did battle. After ending the first period down 2-0, the Bolts came out and put up 3 in the 2nd period, and took a 3-3 tie into intermission. The third period, however, was all Montreal. Defensive turnovers and odd man rushes took their toll, and the Canadiens put up 3 unanswered goals, a couple of which uncharacteristically got by Ramo, to send the Bolts to their 6th straight loss. "We fight back in the game and were able to win that second period," St. Louis said. "It was a tough period in the third but I feel like we didn't really make them earn it." "I feel bad, I let my teammates down after we came back after the first period and what we did in the second period ... I let the team down," said Ramo "I should have had it, I need to be more sharp on those shots." With the loss the Bolts sit just 2 points ahead of LA for last place in the NHL. Baby steps. On the road, the Bolts took one baby step toward getting back on track. The 3-4 loss to Toronto in a shootout was at least 1 point on the board. The team looked decent throughout, although there were still a lot of turnovers and mishandling of the puck. The defense looked tentative at times, allowing Toronto to skate and shoot at will. Ramo was solid yet again, and appears to be the the Bolts true #1 in net, at least for the remainder of this season. The Lightning goals came from Karlsson, St. Louis and Ranger. The final goal, scored with less than a minute left and Ramo pulled, sent the game into overtime. 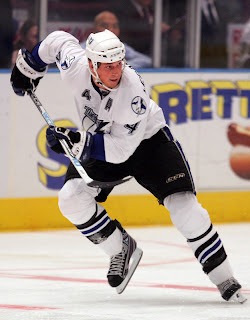 In the shootout, the only Lightning player to tally a goal was Vinny Lecavalier. Ramo was unable to stop either Toronto shooter. (AP) -- Joffrey Lupul got the call he wanted and took advantage against the slumping Tampa Bay Lightning.